About a year ago, I was introduced to “chocomole” by Katie from Kitchen Stewardship. She included a link to a recipe in one of her e-books, “Healthy Snacks To Go” and I was intrigued. So intrigued that I made in the next week. I could not believe it. I still can’t believe it. This chocomole is made from avocados. Yes, my dearly beloved avocados. I have started making this again to help fatten up Tyler. When I make it…they all ask for more. And more. And more. And we end up licking the blender clean! Use coupons for the pistachios…I’ve seen them on Kroger.com digital coupons, and have printed them from the internet, and seen them in the newspaper. This is the first of a few “Food Allergies on a Budget” recipe ideas that I’ll be sharing as part of the series! The recipe is dairy-free, gluten-free, grain-free and tree nut-free if you omit the pistachios. Serve with crushed pistachios on top. Does it taste like chocolate? I don’t really like avacados but if you can’t taste them just the chocolate this sounds like a super way for me to get the health benefits of the avacado and enjoy chocolate. LOL! In my house those pistachios would be instant death. Our food allergies are not only lactose, but tree nuts also. So things that use walnuts, hazelnuts, pistachios, cashews (which I love), brazil nuts are all out. Thankfully we can still use pecans, peanuts, and almonds so I substitute those for most recipes. 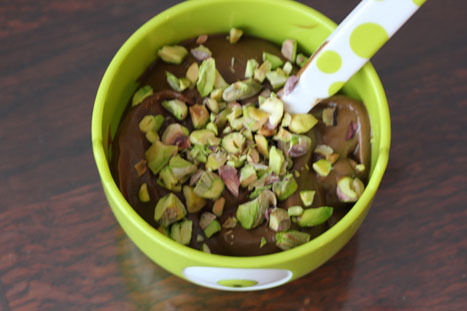 We love chocolate and avocados so I may have to try this with some almonds or peanuts sprinkled on. We are desperately trying to get our 2 year old son to gain weight, without much success. He loves avacados with bananas, I’ll try this one next week! Thank you so much for the recipe! We made this recipe last night and it was very rich and chocolate-y! There was a definite aftertaste of avocado, so my husband, who is not a fan,, couldn’t eat it. I thought it was great. My hubby hates avos too, but doesn’t know they’re in there and loves it. If I tell him, he’ll quit eating it. I don’t think avos have any flavor myself. Cant wait to try this. My husband is allergic to milk so this would be good. Think the kids would like it to. I’ve heard of this before and will have to give it a try. We don’t have any dairy allergies, but I like it as a way to sneak in some avocado. I’m glad that the pistachios are merely a topping, because we also have a tree nut allergy in our house. My oldest is allergic to walnuts, pecans, cashews and pistachios. Thanks for sharing! OH MY GRAVY!!! THIS IS SO GOOD!!! I just made it for dinner and am gonna have trouble staying out of it. i had a few brown bananas, so i threw them in. excellent. Just made this and I have to say WOW! So delicious! Thanks for sharing such a fantastic recipe!!! Wow. I am nursing an infant who is dairy and soy allergic. I have not had chocolate in 4 months…this was heaven for me. I ate it all myself. This looks really interesting! The next time avocadoes are on sale, we’ll have to try this. I’m trying to fatten my 15-month old up and I think she’d love this! And I wouldn’t feel guilty because this will be good for her! Win-win!!! BTW, I’m new to the website and I love what I’m reading! Your recipes are exactly what I’ve been looking for because I need to tighten our food budget and get more organized! Thank you for putting it together for all of us! Made this last night even though I am the only one on a dairy restriction, my kids were licking their bowls and I am savoring the last little bit for my afternoon snack. Great recipe!